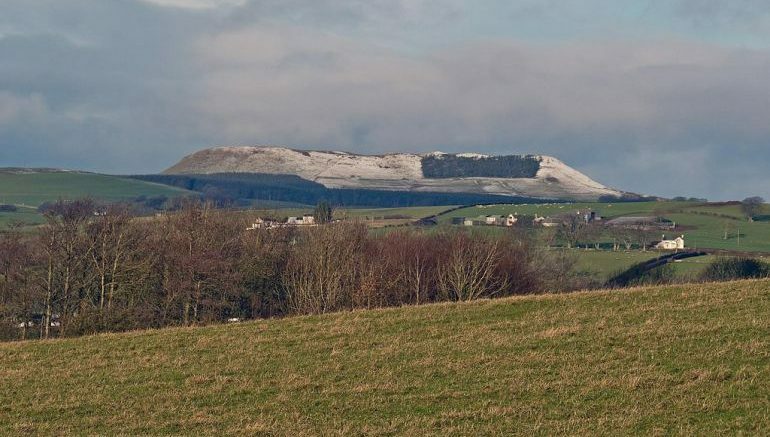 The hill of Burnswark is still mired in mystery when it comes to its ancient military scope; with historians and archaeologists trying to analyse the crucial aspect of this Scottish site that probably defined its role as a launch pad for Roman invasion of northern Britain. In terms of its strategic scope, Burnswark rises around 1,000 ft above the surrounding Solway plain, while its flat-topped summit contain the remnants of a native hill fort. This was complemented by two Roman marching/training camps (with ramparts) on the north and south slope of the hill. But theories deviate hereafter, as to the ambit of what actually took place in the historical context (in terms of warfare). One school of thought talks about how the fort was probably used by the Romans to train their soldiers, especially in ranged combat. While a second hypothesis suggests that the fort was actually occupied by native forces, and the Romans laid siege to it to starve them out. What this probably is, is the start of the Antonine push from Hadrian’s Wall, conquering all of southern Scotland. After the emperor Hadrian has died the new emperor Antoninus Pius needs a victory as the incoming emperor. Southern Scotland is beyond the wall, beyond the borders, it is barbarian and Burnswark and the rest of Annandale and everywhere south of the Forth-Clyde line is its intended target. But the question naturally arises – what evidence suggests a massive Roman push at Burnswark? 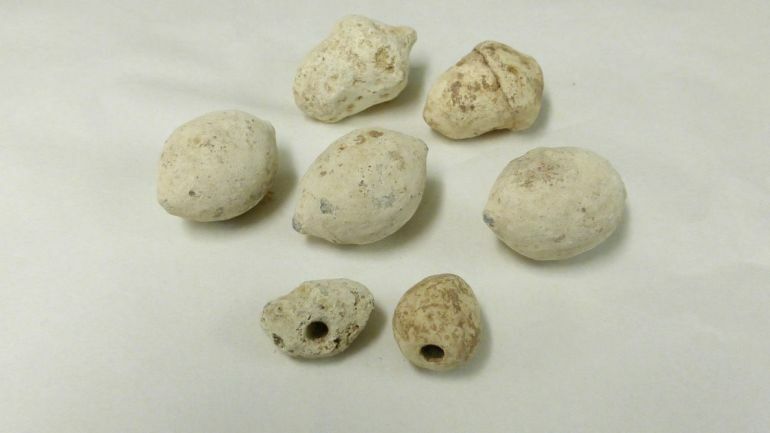 Well one of the fascinating finds from the site entails massive quantities of lead-shot that were fired at the fort. In fact, their sheer volume alludes to a scenario where the Romans made use of mass projectiles to physically (and psychologically) afflict their foes, as opposed to some target practice. And interestingly, many of these sling bullets were drilled with 0.2 inch holes. Now while the conjecture could be made that these odd holes were possibly used for holding poison, the tiny gaps are simply too small. Furthermore the lightweight nature of these ‘dented’ bullets make them inferior in terms of ballistics, especially when compared to their conventional larger counterparts. Such disadvantages would have rendered them ineffective in projectile-based warfare scenarios that entailed throwing poison. You’d hear this screeching noise that you’ve never heard before or experienced before in your life. What sort of unearthly spirits are these dreadful Romans conjuring up to assail you with amongst all their missiles? I hear this keening sound through the air and the chap with the spear next to me drops dead and I wonder what on earth is doing it. I’d be utterly terrified. The Romans were well recognized for what is called exemplary violence. These people literally did suffer the slings and arrows of outrageous fortune. This literally is a site where people suffered an attrition to the very end and I would suspect that probably nobody survived this and the Roman army moved on into the rest of Scotland. Suffice it to say, the Romans in their turn were surely impressed by the Balearic slingers of Hannibal, circa late 3rd century BC. So over time, many of their descendants were inducted into the Roman army, including that of Julius Caesar’s army that invaded Britain in 54 BC. 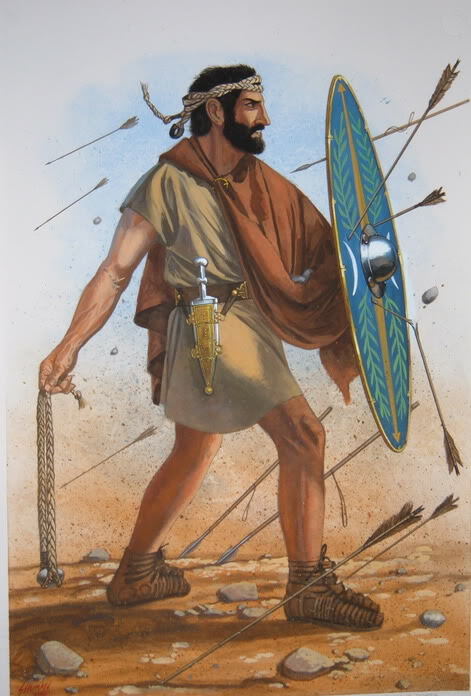 And lastly, as for the expertise demonstrated by the auxilia slingers, these Balearic islanders were said to carry three different types of slings into the battle, each for variant ranges. When translated to figures, according to Reid, a heavy version of a sling bullet could reach velocities of over 100 mph – which would have been enough to “literally take off the top of a head”. A late-Roman slinger. Illustration by Johnny Shumate.